Most of the algae that occur on putting greens naturally inhabit turf soils—all soils for that matter. 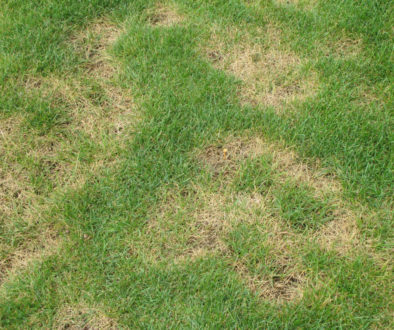 The organisms are always present, but rarely make their presence known because they are unable to compete for space and light with healthy bentgrass and annual bluegrass. When grass growth slows to a crawl and soil surfaces become exposed, algae populations increase quickly to occupy areas vacated by the grass (Figure 1). Continued algal growth results in dense (slimy) mats that, when dry, will form a crusty barrier to light and water (Figure 2). If the barrier is thick enough, it will preclude turf recovery in those areas, and turf quality will suffer unless remedial action is taken. August is a prime month for algae problems in the lower Midwest. Turf growth is naturally slow due to a variety of factors –most importantly elevated temperatures that restrict root and shoot growth. Nutritional stress also contributes to slow turf growth and predisposition of surfaces to algae. Shaded greens are prone to problems because algae can grow in low light conditions—so the shade that impedes turf growth on putting greens, offers a competitive advantage to algae. Mechanical stresses play a role too: It is not uncommon to observe algae on “clean-up” passes (Figure 3). Close mowing (low HOC) will expose more soil to light, giving algae another advantage. Finally, greens damaged by dollar spot, anthracnose, brown patch, localized dry spot, and summer patch also are inviting places for algae to develop (Figure 4). Fig. 1. Algae develop quickly in areas where turf is thin, especially during periods of overcast, rainy weather. Fig. 2. Algal crusts can destroy turf surfaces. Fig. 3. Algae often appear in stressed areas like clean-up passes. Fig. 4. Turf damaged by infectious disease predisposes surfaces to colonization by algae. Preventing turf damage from variety of stresses—environmental, nutritional, and mechanical—is the best way to avoid algae problems. Remember, algae cannot compete with vigorous creeping bentgrass. As we all know–easier said than done. Remedial measures are available. Venting and sand topdressing will break up algae crusts and limit algae growth. A wetting agent will help prevent waterlogged turf. Chemical treatments can be very effective in stopping algae growth and facilitating turf recovery. Some common treatments include chlorothalonil (eg., Daconil), mancozeb (eg., Fore), and a combination of mancozeb plus copper hydroxide (eg., Junction). The chlorothalonil will cover many bases, but it is not as effective the mancozeb plus copper hydroxide combination. Copper can be phytotoxic, so be sure to take certain precautions—use labeled rates, and do not spray during the day when temperature exceeds 85F. I think the Junction treatment will be most safe and effective when evening ambient temperature remains below 70 F and turf has a chance to recovery at night.